Copyright © 2005 LITUANUS Foundation, Inc. Finally, after several attempts to put together a show and many years of waiting, the art of M. K. Čiurlionis is being exhibited in the United States. Though the show contains relatively few works, it represents the beginning of Americans' acquaintance with the Lithuanian painter and composer. Čiurlionis is one of 40 synaesthesia artists from all over the world whose works span over one hundred years, between 1905-2005. His works in this show are small and humble; in Los Angeles, Sparks I-III , which is a very early work, and in Washington, Sonata Nr.6 . Nevertheless, there is something fascinating about his dream of color and sound that comes through in these works. In seven years, Čiurlionis created some 300 paintings and a good number of sketches. The inclusion of his three small works in the "Visual Music" fest in Los Angeles was a wonderful discovery for Čiurlionis lovers, who for many years taught that his attempted synthesis of the arts was a mere metaphor. It is not by coincidence that most artists that attempted this type of synthesis of the arts were firstly musicians and then painters. After all, music is an abstract art. Now, one step ahead, with the synaesthesia, we can see that Čiurlionis really painted music and composed colors, like so many other contemporary followers of synaesthesia did, including Wassily Kandinsky, Aleksandr Scriabin, Arnold Schoenberg, and Frank Kupka. All of these artists are part of this extraordinary exhibit a first to my knowledge anywhere in the world, and its importance is not to be underestimated. As Jeremy Strick, director of the Museum of Contemporary Art [MOCA] observed in his introductory remarks in the immense catalog that accompanies the exhibit " 'Visual Music' traces an alternative history of abstract art', whose importance is beginning to surface only now. Now, Washington has a chance, for the first time, to see Ciurlonis' wonderful Sonata No. 6, or as we have come to know it, the Sonata of the Stars [Allegro and Andante, 1908], painted only one year before he became ill and three years before he died in 1911. Sonata No. 6 (Sonata of the Stars). Allegro. 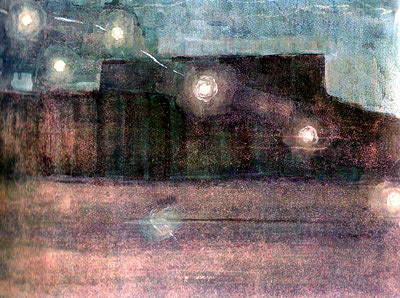 Tempera on paper, 73.5x61.5 cm, 1908. Sonata No. 6 (Sonata of the Stars). Andante. Tempera on paper, 71.2x61.54 cm, 1908. 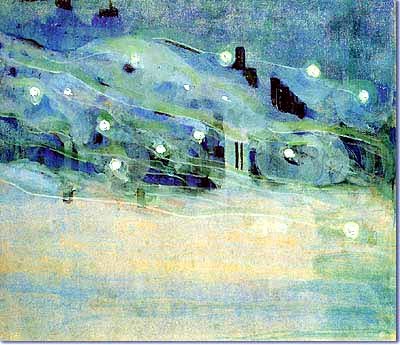 Judith K. Zilczer, Hirshhorn Museum and Sculpture Garden curator emeritus, begins her catalog essay, [Visual Music: Synaesthesia in Art and Music Since 1900, New York, Thames & Hudson, 2005], with a section that she names "Prelude" with three painters, James McNeill Whistler, M.K. Čiurlionis and Arnold Schonberg, in that order, with Edward Munch somewhere in between. Whistler's "Nocturne in Blue and Gold: Valparaiso" , also chosen for this exhibit at least in the catalog, was the first to play with the idea of the synthesis that Čiurlionis would attempt 20 years later in his sonatas and cycles. 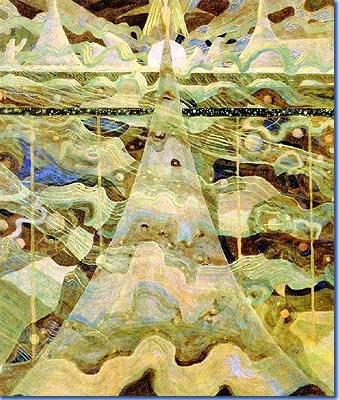 Čiurlionis' paintings had one advantage - musical structure - taking them one step ahead toward the desired goal of synthesis. In the case of "Sparks," each of the three paintings is like a different frame of a film. 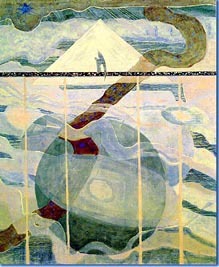 The curators' intention was to exhibit seven of the 13 paintings of the "Creation of the World" cycle, but Kaunas Museum refused to show only part of the cycle. Sparks I from the cycle of three paintings. 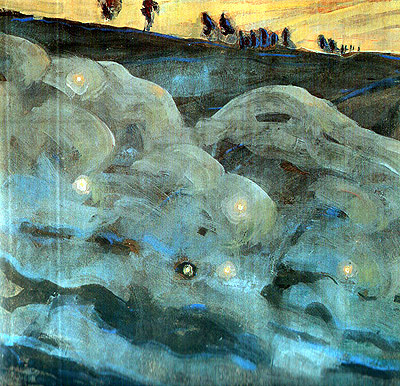 Tempera on paper 31.1x36,2 cm, 1906 Sparks II from the cycle of three paintings. Sparks III from the cycle of three paintings. Čiurlionis' work is limited to the first room of the exhibition, where artists seem to be borrowing music titles to name their paintings as a metaphor, not completely convinced that they can synthesize color, music and movement: Kandinsky, Kupka, Stanton MacDonald-Wright, Mikhail Matiushin and Morgan Russell as well as Paul Klee are in the next room. To be part of such company would be quite an honor for Čiurlionis, a beginner from a remote province. This exhibit should dispel any doubts about Čiurlionis' place in the world of art. Baudelaire, one of the best combinations of poet and critic, wrote a poem that best summarizes the goal of modern art "Les parfums, les couleurs et les son se répondent" ["Correspondences" 1857], translated by Richard Wilbur as "All scents and sounds and colors meet as one." Today, the verse sounds like a prophesy of the direction that art was going to take. Only a few years later, Odilon Redon and the Symbolists would take art to the adventure of synthesis, and then, with the movement, also suggested in the poem as Ayant l'expsansion des choses infinies/ Comme l'ambre, le muse, le benjoin et l'encens," will come synaesthesia, the main purpose of this exhibit. If only Čiurlionis had lived longer, he would have seen his dreams where scents, sounds and colors correspond confirmed. His works were still very heavily based on nature's shapes and colors and movement was almost nonexistent. That would come 40 years later, with Stan Brakhage, the Whitney brothers and Harry Smith, included by Jonas Mekas in his New American Cinema. And then add film, as Oscar Fischinger in the late thirties did, in the movie "Fantasia" with the first part of Bach's "Tocata and Fugue in D Minor." Never mind that Walt Disney did not understand Oscar's genial approach. Today, the best part of that film is still the parts that were created by Fischinger. Sound tracks became the simultaneous vehicle of beautiful color and beautiful sound. Now, many years later, both artists - Čiurlionis and Fischinger - are together, in one show. This is an extraordinary coincidence, and many more can be found in this exhibit. Kerry Brougher of the Hirshhorn Museum begins his long and excellent essay "Visual-Music Culture" with Kandinsky's "Mickey Collage" [c. 1940], where four Mickey Mouse characters roam through the abstract painting. Fantastic. There are many artists missing in this exhibit, because there is no way that they could all fit in one place, but still I am missing Piet Mondrian ["Broadway Boogie Woogie"], Edgar Varese, Nam June Paik, John Cage, Olvier Messiaen, David Hockney, Karlheinz Stockhausen and Viacheslav Ivanov, whose brilliant essay on the Synthesis of the Arts can be found in Čiurlionis: Painter and Composer. Collected Essays and Notes 1906-1989. Chicago/ Vilnius, Draugas/Vaga, 1994, pp. 74-95). However, the excellent catalog in some ways supplements the shortcomings of the noisy exhibit. Through the years Lituanus has devoted many special issues to M.K. Čiurlionis. This exhibition will justify all of those past issues. This time, Lituanus is proud to introduce these five paintings of Čiurlionis in color, as a celebration of the journal's 50th anniversary and as an homage to the artist's first public appearence in a major American museum.